This Kat has always felt a sense of unease in seeking to understand the relationship between the IP and trade aspects of the TRIPS agreement (Agreement on Trade-Related Aspects of Intellectual Property Rights), since it went into effect on January 1, 1995. As IP practitioners, we tend to view TRIPS in terms of international IP treaty-making, namely the most comprehensive attempt by the international community to set minimum standards for intellectual property rights. That is fine, as far as it goes. Standards in a Trade Law Format”, to do so is to miss the essential point--TRIPS is not merely an IP treaty. Rather, it is part of a multinational trade arrangement (Annex 1C to the Agreement establishing the World Trade Organization), deriving from the Uruguay Round of multilateral trade negotiations (1986 – 1994), resulting in the establishment of the World Trade Organization. Most notable are its arrangements for dispute resolution between governments (the WTO Dispute Settlement Understanding). As stated by Lars Anell (former Chairman of the Negotiating Group on TRIPS) in the Forward to the book, the inclusion of the TRIPS Agreement, building on treaties developed in another organization—WIPO, was the most “surprising” (p. ix) outcome of the Uruguay Round. It is this link between intellectual property rights, on the one hand, and the mechanisms for dispute resolution based on trade law principles, on the other, that gives TRIPS is unique character. And what a complex, multi-layered, nuanced character it is. 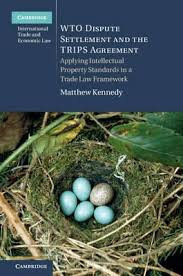 As Kennedy graphically observes, negotiating and implementing an IP agreement within the framework of a “multilateral trading system [is] like a cuckoo’s egg laid and hatched in the nest of another species” (p.1). How these two systems interweave and interact is the focus of Kennedy’s book. Covering over 450 pages (mainly) of text, supported by tables and case summaries, the book is divided into eight substantial chapters, ranging from discussion of procedural pitfalls to treaty interpretation. Each of the chapters is based on copious research and benefits from careful analysis and discussion. The overall impression is that anything that this Kat might have wanted to ask about the relationship between TRIPS and the WTO framework, with particular attention to the dispute resolution mechanism, is dealt with by Kennedy in a thorough fashion. The challenge of language and conceptual underpinnings is particular daunting. On the one hand, IP practitioners are called upon to learn the lexicon of trade law. Kennedy’s book is an excellent guide to navigating this lexicon in the context of TRIPS. On the other hand, trade law needs to take care to avoid what Kennedy calls “fusion fallacies”, namely, “[b]lindly transplanting concepts of trade liberalization into intellectual property standards, simply because TRIPS is an integral part of the WTO Agreement.” The temptation to do so is especially present when dispute resolution practitioners, who tend to come from the trade law world, are “all too ready to transpose familiar concepts from trade law” (p. 403), without giving proper thought to the IP context in which they arise. The author seems well-suited for the task that he has set for himself. He is currently a professor at the Faculty of Law at the University of International Business and Economics in Beijing. Before then, he was a senior lawyer at the WTO Secretariat and Secretary of the WTO Council for TRIPS. IP professionals who want to gain a better grasp of the complexity that undergirds TRIPS within the context of trade law will be well-advised to add Kennedy’s book to their library. Kennedy, Matthew. WTO Dispute Settlement and the TRIPS Agreement. Cambridge, United Kingdom. Cambridge University Press, 2016. ISBN 978-1-107-14468-2: Available in hardback, here. you just read the article about Book Review: WTO Dispute Settlement and the TRIPS Agreement and can you bookmark or share with link https://ghchjgv.blogspot.com/2016/10/book-review-wto-dispute-settlement-and.html so thank you.